Dahanu, popularly known for it's fascinating beach, is a coastal town located in Thane district of Indian state of Maharashtra. The town has derived its name ‘’Dahanu’’ from Dhenu, which means cows. It is believed that people in the village once owned many cows. The town now is a major industrial and commercial center in Thane district. It is also known for Chickoo fruit production. Dahanu contributes about 35 per cent of total production of Chickoo in India. It is also famous for rose garden and coconut grooves. Rubber balloons and rice mill are other industrial products of the Dahanu. It houses a mega power plant of 500mw which provides electricity to the city of Mumbai. The task of distributing electricity is done by Reliance Energy. Situated between magnificent ranges of Sahyadri hills and Arabian Sea, Dahanu is a major tourist attraction. 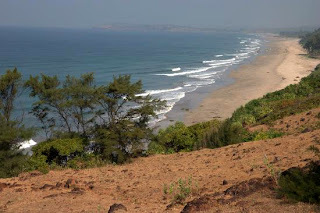 It is gifted with 15 km long beautiful beach on one side and long Chickoo grooves and Suru trees on the other. Dahanu is home to many temples in and around it. Sri Kevda Devi Mandir, Jagruti Hanuman Mandir, Santoshi temple, Sri Gajanan Mandir are some of many other temples worth visiting in and around the town. The town also houses beautiful sculptured Jain temples. One of the temples is located in the Dahanu Gaon. It is about 100 years old. Chandrababu temple is another temple around the town. Situated at Kosbad hill, a newly built temple has become very popular among the tourist from Mumbai and Guljarat. How to get there: the town of Dahanu is well linked by rail and road to other parts of the state and the country. Many state run buses and private luxury buses are available from other cities and towns of the state to reach here. It also has well maintained railway station which is well connected to Mumbai, Pune, Ahmadabad and many other cities of the state and the country. Nearest airport to Dahanu is located in the city of Mumbai which is about 143 km away from the town. The airport is well connected by domestic and international flights to many major cities of the country and the world. Other details: Majority of people living here is of tribal communities. We get see the Tribal culture in their living style and language. A number of foreign students reside here to learn the Warli Art, the world famous art which originated here. Along with the major festivals of the country like Diwali and Dasara, the people of Dahanu celebrate Koli Bhaji, Nag Panchami Gauri Ganpati and other local festivals with great enthusiasm.